Take a pan, pre heat oil and ghee, splutter mustard seeds, add urad dhall, channa dhall and asafoetida powder and fry it till golden brown. Add green chillies and ginger and saute' for a minute. Now add the semolina/vermicelli to it and saute for another 2 mts. Add chopped onion and stir it till it becomes transparent. Add chopped tomato to the ingredients and mix it well. When everything is finely cooked, add the water, salt and let it boil for another 4 mts. Now add the rava/sooji to the water and stir it and make sure no lumps are formed in it.. Cover it with a lid till it fully cooked. Reduce the flame. When it is fully cooked, garnish it with fresh curry leaves and coriander leaves. Serve it hot with chutney. *** - What I usually do is, I first add water in the tawa after seasoning. The quantity will be 1/2 or 3/4 of the tawa(according to the required quantity of upma). When it starts boiling, I will just add rava and the quantity of rava will be 3/4th of the water. So I usually don't measure water and rava. The 1/4th water will help the rava to cook. Life saver to me. Whenever in hurry this comes handy.....Looks yum with that chuteny. Vidhya. Nice Recipe. Even for me, I only recently feel comfortable making upma with rava...I would not get the water to rava ratio right and the rava would not get soft. For me the trick was to pour and stir in rava little at a time. Other than rava upma, I like puffed rice upma and quinoa upma. There are so many varieties. What others do you like? Beautiful color, love the thali! First here and u do have greattt recipe collections. Keep it up dear !!!! 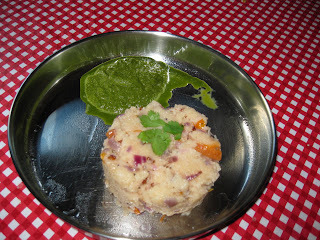 I love upma and urs looks yummmmmm!!! !